Nick Rye and Hurk travel to the Red Planet in Lost on Mars, the second DLC for Far Cry 5. Both try in this new scifi adventure to restore ANNE, a futuristic AI and humanity's last defense. To face properly the planet's arachnids, players have an alien weaponry at their disposal. New screens and trailer inside. 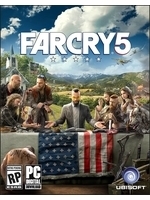 SAN FRANCISCO — July 17, 2018 — Today, Ubisoft announced that Far Cry® 5: Lost on Mars, the second post-launch adventure, is now available on PlayStation®4 computer entertainment system, the Xbox One family of devices including Xbox One X and Windows 10 PC. 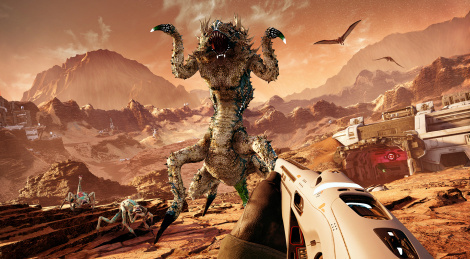 Lost on Mars continues the uncanny adventures in the Far Cry 5 Season Pass as players travel to Mars as Nick Rye alongside Hurk to eradicate alien arachnids. Lost on Mars can be purchased as stand-alone DLC for $9.99, as part of the season pass for $29.99 or the Gold Edition for $89.99. • Blaster of Disaster: A single-shot space gun made of trusty alien hardware. • Hellfire: Fires 15 bouncing laser balls, inflicting serious damage. • Morphinator: Harness the power of science to turn predators into prey – with an explosive twist. • Space Jets: Defy gravity and blast across Mars in an entirely new way to navigate extraterrestrial terrain. Looks like it will be my fav dlc from the pass so maybe i'll save it for last. Some Starship troopers vibes from these pics and trailer. I don't know how long it is really, but they should done the same as with Blood Dragon and release it as standalone game ;) I have no intention to play FC5 but I would gladly buy this - looks really good & fun hope it plays the same.